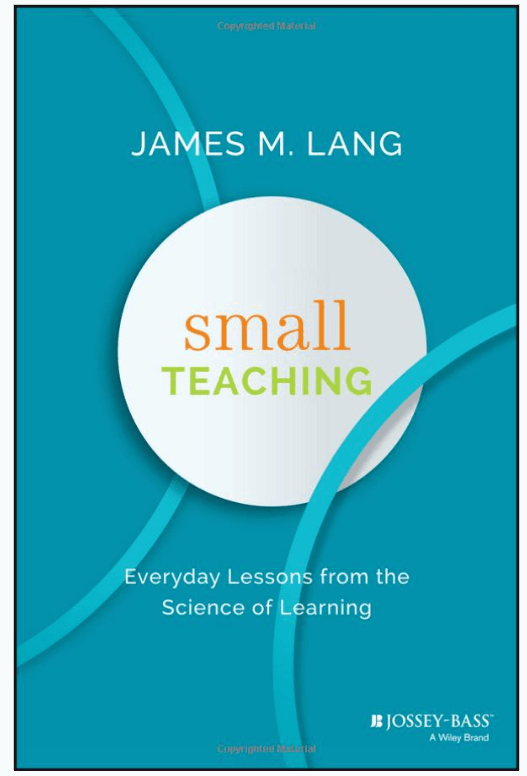 It is a few years old now, but I finally got around to reading Jim Lang’s excellent book Small Teaching: Everyday lessons from the science of learning (2016). As an online teacher in graduate programs, I was interested in both what I was currently doing that aligned with this book, and what I could be doing better. I have just wrapped up 12 weeks of EDU-6323 – Technology as a Medium for Learning, so this is a good point for some reflection…particularly as the textbook for my course is Michelle Miller’s Minds Online – which Jim cites in his book. Jim attempts in his book to suggest small changes that could be implemented immediately, such as brief 5-10 minute classroom activities, one-time interventions, or small changes in course design or communication. He provides three sections (Knowledge, Understanding, and Inspiration), with each section further divided into three topics. In EDU-6323, one of the hot spots students noted was how learning science basically debunks the idea of individual learning styles. 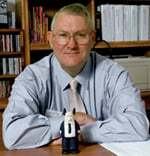 In the Knowledge section, Jim cites Dan Willingham, who noted that you can not think creatively about information unless you have the information in your head with which to think. Jim provides background theory and activities for retrieving knowledge, predicting as a means of surfacing prior knowledge, and interleaving to space and mix up learning activities. In EDU-6323, we explored the testing effect, spacing, and polling as activities for learning. Several of my students noted that the staggered deadlines for tweets, discussion posts, and papers acted as an interleaving practice. In the Understanding section, the focus was on active learning. The three topics included connecting, practicing, and self-explaining. 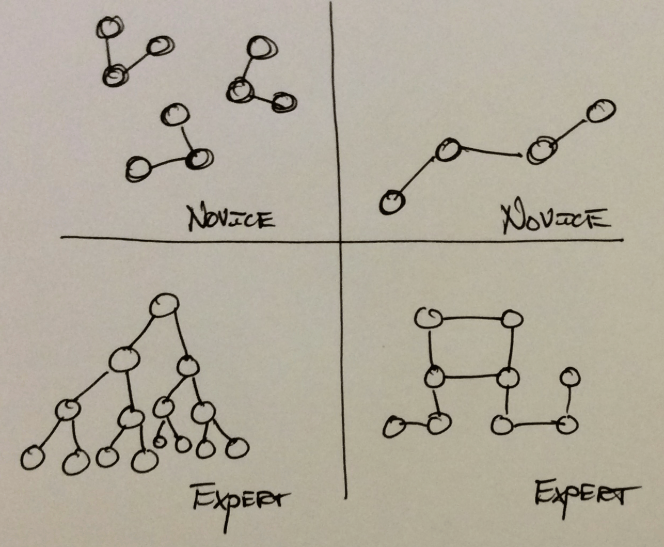 Jim noted the work of Susan Ambrose towards detailing the differences between novices and experts in understanding, with experts tapping in to deeper knowledge connections than novices. Practicing came up this week in my doctoral class on Technology and Leadership. Students were exploring different web tools and platforms, including TEDTalks. Jim talked about the importance of practicing to good classroom presentations, and that same process is important in the TED Talk format. For both connecting and self-explaining, one thought I had was that in an online environment in which you mix both LMS and social media, Twitter becomes another avenue for making connections and particularly for thinking aloud, if you will. It is always fascinating to me to see the interplay across both LMS discussions and tweets…and in this course, we also used Diigo for collaborative research. Years ago, Barbara Ganley (@bgblogging) stated “Tweet to Connect – Blog to Reflect”…and that spirit continues in courses that mix long post formats for discussions with short tweets. One activity I include in both this course and my Social Media course is the idea of connecting with experts through social media…the development of a personal learning network. Many of my students have been surprised by how top names in education and learning respond to their tweets…which segues nicely into the last section on inspiration. In Inspiration, Jim explored activities for enhancing motivation and attitude. This again aligns with Michelle Miller’s Minds Online chapter on motivating students. Jim provided solid suggestions around motivating, developing growth mindsets, and expanding personal learning. While the technology is somewhat dated, students in my class were still excited by the ability to screencast, and the building of screencasts by students can be motivating as well as tap in to self-explaining. Jim’s book was primarily geared towards higher education classroom teaching, but I think it is equally applicable to K12 and to online teaching…which is my venue. 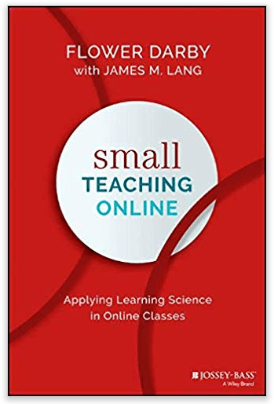 Jim has teamed with Flower Darby to publish Small Teaching Online: Applying Learning Science in Online Classes – due out in June…and my pre-order is already in. Jim (and hopefully Flower) provide actionable techniques that can improve any course. It affirmed some of my current practices like staggered deadlines and mix of social media and LMS activities…and suggested new ones for me to try, I highly recommend that teaching or learning professionals check it out.